Elephants in Bhutan have begun eating oranges for what is believed to be the first time, officials have told the country's main English newspaper. A report in the Kuensel newspaper says that elephants have developed a taste for mandarins in orchards in the south-east of the country. Villagers told the newspaper that they were shocked to see the animals tucking into the fruit. "This has never happened before," one villager told the newspaper. 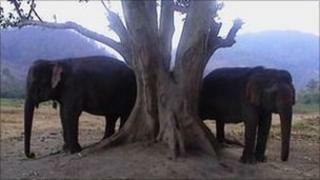 Experts say that Bhutanese elephants eat between 149 and 169kg (330-375lb) of vegetation daily. While it is not unknown for them to eat some forms of fruit along with grass, small plants, bushes, twigs and tree bark, in Bhutan it seems that they have only recently developed a fondness for oranges. "This has never happened before," orange exporter Pushpa Adhikari told Kuensel, "and we are totally aghast. "It's a serious threat to one of our main income sources." Villagers believe that the lack of fodder in the jungles has forced the giants into the orchards in search of food and that it is only a matter of time before the animals start moving into other orchards in the south-east. The World Wide Fund for Nature (WWF) in Bhutan says that in recent years, clashes between elephants and humans in the south of the country have become more commonplace. In 2007, wild elephants destroyed an estimated 132 acres (53 hectares) of land. The WWF says that the animals' traditional migratory routes have "been blocked by human intervention through rapid industrialization and infrastructure development". Villagers say that they not only have to contend with the loss of their crops, but also the destruction of trees. At least two orchards have so far been destroyed. They say that branches have been ripped off and fruit scattered all around, while elephant dung coated with orange seed litters the ground.